William Heath Robinson was the master illustrator and cartoonist that was famous for his crazy mechanical contraptions and inventions. Therefore it is no surprise that the motor car featured heavily in his drawings and three books were published of his motoring work. Heath Robison was born in Hornsey in 1872 so he must have been a young man before automobiles started appearing on the streets. Initially he tried to make a living as a painter but this was unsuccessful. Thereafter he worked as a commercial artist in black and white principally on book illustrations but also for advertising. By the time he was 30 Heath Robinson was starting to draw his humorous drawings, submitting them to the popular magazines of the day. His first motoring book was ‘The Home Made Car’ but he was doing advertising work for motor manufacturers such as Daimler and suppliers such as Connolly Leather. There are also a series of advertisements for Duroid Roads which was a patent smooth road surfacing. Heath Robison’s association with Connolly leather started in 1920 when they asked him to produce a twelve page booklet (Nothing Like Leather) for distribution at the Motor Show. This led to 10 brochures plus calendars being produced between 1920 and 1936. Many of the drawings show the use of leather in motor vehicles. 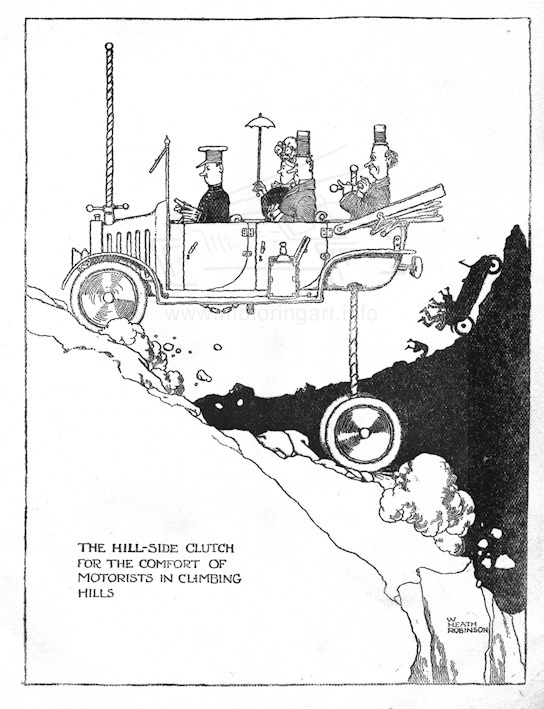 The second book was a 60 page paperback issued by The Motor Owner probably around 1923 called ‘MOTOR MANIA a few attacks by W Heath Robinson’. 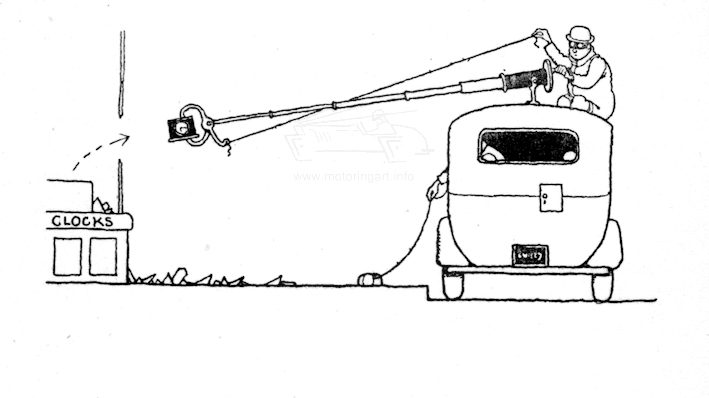 Probably his best known book ‘How to be a Motorist’ was not published until 1939. This book has been re-published several times and cheap editions are available. Fortunately the original artwork for this book survives and some of the illustrations occasionally appear in auction. Much of Heath Robinson’s work was pen and ink black and white but where coloured he used thin pure colours to give a very pleasing effect. He did however paint larger works such as murals and stage sets plus he designed a house for the Ideal Homes Exhibition. 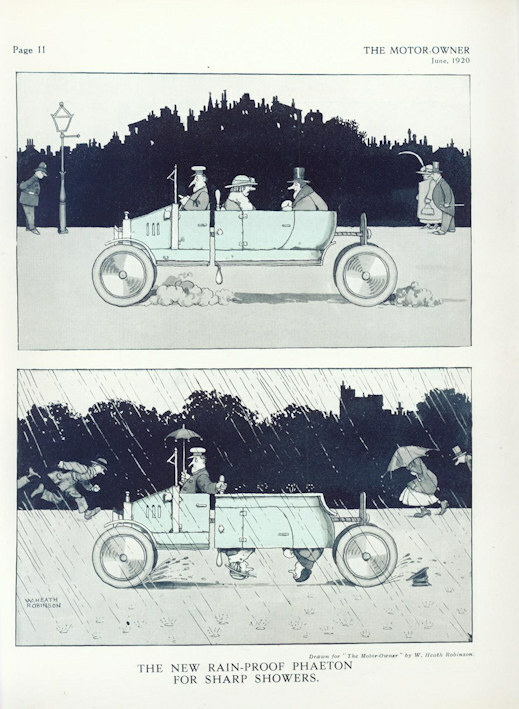 We are very fortunate that such a genius as Heath Robinson was obviously fascinated by cars and used them so often in his art. The Home Made Car by Heath Robinson published Duckworth 1921 Motor Mania by Heath Robinson published The Motor Owner circa 1923 How to be a Motorist by Heath Robinson and Browne published Hutchinson 1929 There are huge number of books written about the art of Heath Robinson so will not attempt to list them here.